The Midwinter Exposition covered 160 acres and opened officially on January 27, 1894. 180 structures representing all California Counties, 4 other states, the Arizona Territory, and 18 foreign nations and villages, including a Japanese Village, were all represented on the grounds. The fair left an enduring legacy on Golden Gate Park. Several exposition displays continued as some of the parks more popular attractions, including the Japanese Tea Garden, and two sphinxes which once guarded the Egyptian-style Fine Arts Building, predecessor to the de Young Museum. Michael O'Shaughnessy, the chief engineer for the fairgrounds, designed the layout for the Midwinter Exposition to be centered around a grand court (modeled on the Grand Basin of the World's Fair in Chicago); O'Shaughnessy would later become City Engineer and oversee construction of the Hetch-Hetchy water system. Marks the spot where M.H. de Young turned the first spade of dirt to begin construction of the fair. was still an amazement to many visitors from small towns and rural communities; some had never before seen a working incandescent light bulb. 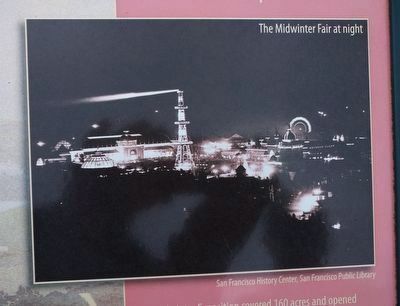 The bulk of the fair site returned to parkland under the diligence of park superintendant John McLaren, but the Golden Gate Park Music Concourse continues to retain much of the character of the California Midwinter Exposition and here it is still fairly easy for park visitors to recall the festive atmosphere of 1894. 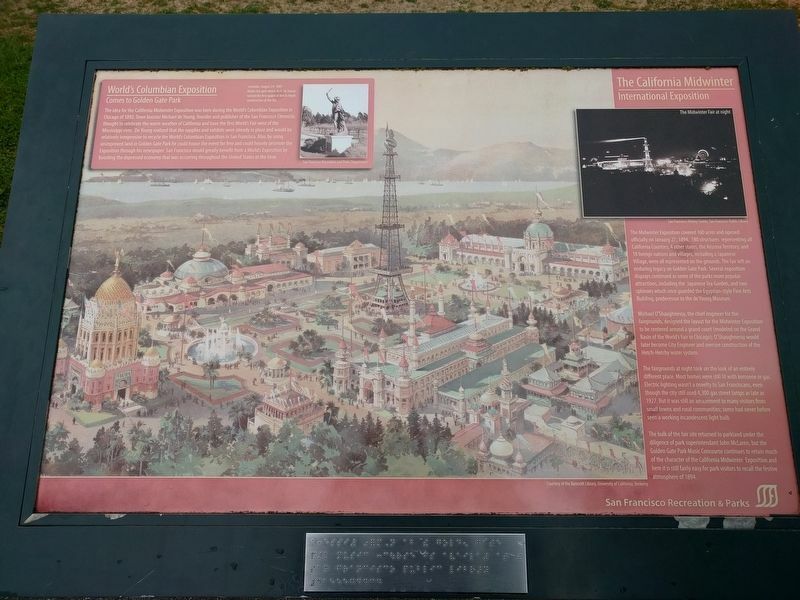 The idea for the California Midwinter Exposition was born during the World's Columbian Exposition in Chicago of 1892. Town booster Michael de Young, founder and publisher of the San Francisco Chronicle, thought to celebrate the warm weather of California and have the first World's Fair west of the Mississippi river. 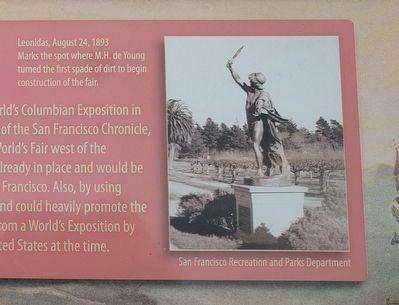 De Young realized that the supplies and exhibits were already in place and would be relatively inexpensive to recycle the World's Columbia Exposition in San Francisco. 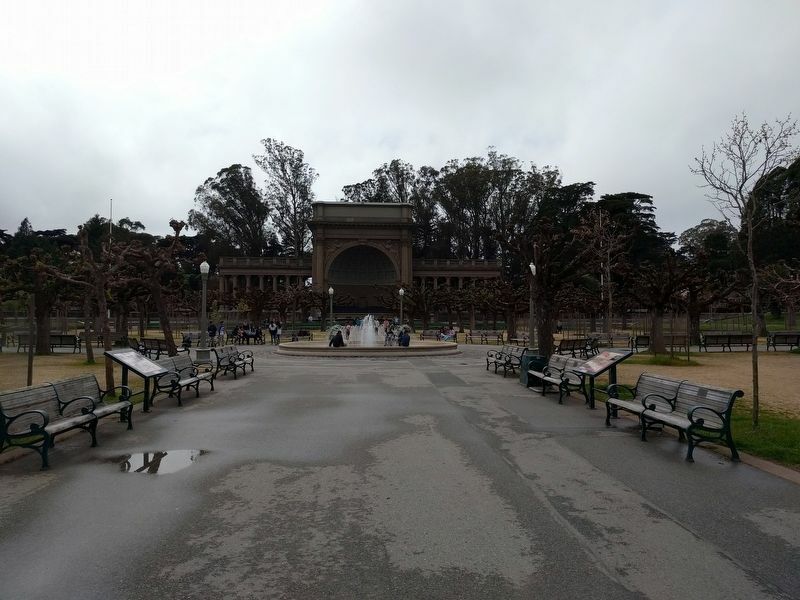 Also, by using unimproved land in Golden Gate Park he could house the event for free and could heavily promote the Exposition through his newspaper. San Francisco would greatly benefit from a World's Exposition by boosting the depressed economy that was occurring throughout the United States at the time. Location. 37° 46.23′ N, 122° 28.066′ W. Marker is in San Francisco, California, in San Francisco City and County. Marker can be reached from Music Concourse Drive north of Martin Luther King Jr. Drive, on the left. Touch for map. Marker is in the Music Concourse between the south two fountains in Golden Gate Park. Marker is in this post office area: San Francisco CA 94118, United States of America. Touch for directions. Other nearby markers. At least 8 other markers are within walking distance of this marker. The Music Concourse (here, next to this marker); Japanese Tea Garden (about 400 feet away, measured in a direct line); Golden Gate Park: A Brief History (about 400 feet away); The de Young Museum in Golden Gate Park (about 400 feet away); The California Academy of Sciences (about 400 feet away); Japanese Tea Garden Gates (about 500 feet away); Migration of the Monastery Stones (approx. ¼ mile away); Planning Golden Gate Park (approx. ¼ mile away). Touch for a list and map of all markers in San Francisco. View looking south toward the bandstand. This marker is on the right. More. Search the internet for The California Midwinter International Exposition. Credits. This page was last revised on April 12, 2019. This page originally submitted on April 12, 2019, by Joel Seewald of Madison Heights, Michigan. This page has been viewed 35 times since then. Photos: 1, 2, 3, 4. submitted on April 12, 2019, by Joel Seewald of Madison Heights, Michigan.